I recall when our son Bobby was a little tyke. He had a friend who lived across the street whose name was Glenn. These two boys were buddies. Bobby’s mother would take Bobby across the street to play with Glenn as well as Glenn’s mother bringing Glenn over to play with Bobby. Bobby one day decided he would go on his own and cross the street to play at Glenn’s house. He did so without permission or his mother. When Mrs. G saw what had happened she immediately went across the street brought Bobby back home. Bobby could have been run over by a vehicle while crossing the street. Mrs. G scolded him and grounded him to the inside of the house. Time passed and soon Bobby and Glenn were playing once again at each others houses. One day Bobby got his nerve up to cross the street to go to Glenn’s house unbeknownst to his mother. This time Mrs. G brought Bobby back to the house and gave him the whipping of his life. He was never allowed to go across the street to play with his buddy Glenn at their house. Glenn could still come to our house with his mother escorting him across the street. Glenn’s mother was one of the kinds of moms who screamed at Glenn constantly. When Glenn would do something wrong she would raise her voice to reprimand him. One day Glenn started to cross the street alone. His mother saw a pick up truck coming down the street and she screamed at Glenn. Unfortunately Glenn had become innocuous to the raised voice of his mother. A tragedy occurred as a result and could have been avoided had his mother dealt with her son in a normal fashion and saved her scream for emergencies. Some times the rhetoric needs to be at a higher level than normal. I have on a weekly basis now for three years written about my traveling and my soul winning. I did not know what a BLOG was until three years ago. This BLOG was never intended to be involved in every little thing that would come along. Yet, when a major issue affects all of us I feel it necessary to speak up and give an answer of my faith. Not for self-aggrandizing, but because it is the responsibility of the elders to speak clearly for there is a next generation following us. WOW, I just admitted to being old! Ha! The word “offended” has one definition of “to break a commonly accepted rule or principle.” In other words these words spoken are intended to avoid future breaking of Biblical principles or Biblical rules. The principles are like the white lines on the edge of a road and the white with yellow lines in the middle of the road to aid one in his or her traveling toward a destination. John 16:1 speaks of words so spoken so one will NOT BE OFFENDED. These words are given to be a warning for the future and not a stumbling block for the present. Only when one stiffens their neck and the offense is turned into a defense is one in danger. When these words become a defense one is not open to instruction and the result is a closed ear and a stiff neck of pride. The mature Christian has a greater possibility of having a stiff neck. A baby has bones of softness that do not exist in an adult body. That is why babies are more likely to survive injury than an adult. Immature Christians are pliable while mature Christians tend to not want to hear and despise being wrong. You can be right so much of the time you begin to believe you are right all the time. I am in a small way a leader, but I am not THE leader. I am in a small way an influence, but I am not THE influence. I seek to have influence in this situation because Hammond is and has been apart of what and who I am. Unless the leaders of FBC renounce and identify the errors of Jack Schaap they cannot lead on from here without this happening again. The “sin” has been renounced, but the underlying doctrinal errors have not been addressed. The question must be asked and answered who is FBC in reality? Do you still believe in devil possession of a saved man? Do you still believe in “bride chamber theology”? Do you still believe in a non-preserved inspired King James Bible? Do you still believe God hates us per the “FOR CHRIST’S SAKE” sermon? Do you still believe the attendance grew some 108% or more? Do you still believe glorifying Rick Warren in your books? Do you still believe John chapters 15 & 17 are sexual in nature? WHEN DOES A NON-CHURCH MEMBER HAVE A RIGHT TO SPEAK UP? Let me address this issue of FBC being an independent Baptist church. Men like myself are being told it is none of our business what goes on in Hammond, IN. That is a legitimate question and deserves an answer. If this is the position of FBC then why ratchet up the phone banks to begin calling pastors all over America to find out who is on board? Why ramp up the PR for the college if you just simply have a desire to be left alone and be just a local church? Why have a Mega Conference if your desire is to be left alone? I ask this because if this is what FBC desires then prove it by leaving our children and our churches alone. If this is true then this is the last you will hear from me and I wish you the best. If not please understand a nation of God’s people cannot sit idly by and let one church ruin what God has done and wants to do. I implore you dear leaders to seek council from the older men of God who love you and are seasoned veterans. Jack Schaap made it clear in the first Pastors’ School he did not care what those over 50 had to say. I cringed when I heard that statement. This statement and attitude scared me and now has proven to be a critical mistake. Moody church whether it is strong or weak is a local church that will for ever be linked to the man D. L. Moody. Spurgeon’s Tabernacle whether it is a weak or a strong local church will always be tied to the man Charles Spurgeon. 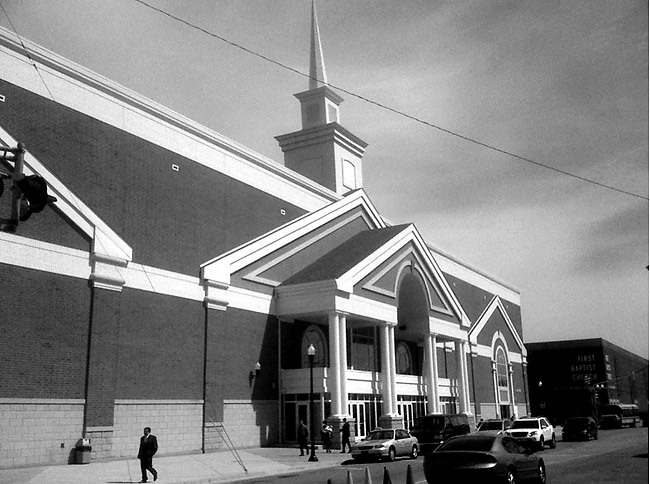 Highland Park Baptist Church whether a strong local church or a weak local church will always have her name linked with Lee Roberson. The same will be true for FBC of Hammond, IN. The truth is she will not be associated with Owen Miller, but for ever associated with Jack Frasure Hyles. My concern is with the Biblical principles employed by Dr. Hyles that they not be lost in this present turmoil and transition. FBC was chosen of God to help a nation to be revived spiritually. I have no problem with that, but when that same church distances herself from those principles that she used which caught God’s attention it scares me. PLEASE make a list of seasoned older men of God and talk to them. Do not become your own client in this case! FBC needs Biblical principles that will lead her to the right man of God and the knowledge of wrong principles that will lead to the wrong man of God. How about this time going back and re-reading the instructions given by Dr. Jack Hyles the last time on how to call a pastor? HOWEVER, THIS TIME DO WHAT HE SAID!